It was a sad but unsurprising exit from the Steel City for the 39-year-old Guerin, who had 21 goals and 45 points in 78 regular season games last season in addition to four goals and nine points in 11 playoff games. While he showed that he is still capable of putting the puck in the net, Guerin eventually started to look his age, and he missed several playoff games to boot. Guerin made $2 million last season, and the team currently has less than $2 million in salary cap room, which creates another barrier to his return. With Guerin looking to hang on for at least another year, this was a parting of ways that was not too shocking. Look for him to hook up with a new team in the near future. Guerin came over from the Islanders on a deadline deal in 2009 and was the team's third-leading scorer during their Stanley Cup run, notching 15 points in 24 games. By all accounts, he was a solid presence in the locker room, enjoyed playing in Pittsburgh, and made some key contributions to Penguin history along the way. But as the years pass, the maturing Penguins need the well-aged veteran types less and less, and consequently will probably be able to plug in a lower-priced replacement in Guerin's place. The young Pens won't offer the same presence that Guerin did, but that's how life goes in the salary cap era. You just can't keep everyone. In other news of the Flightless Birds, all is not well with Jordan Staal, who has had "a few setbacks" with his right foot according to Ray Shero. Staal cut a tendon on the top of his foot on April 30 and has had two surgeries since then, but the team sounds unsure if he'll be able to start training camp on time. 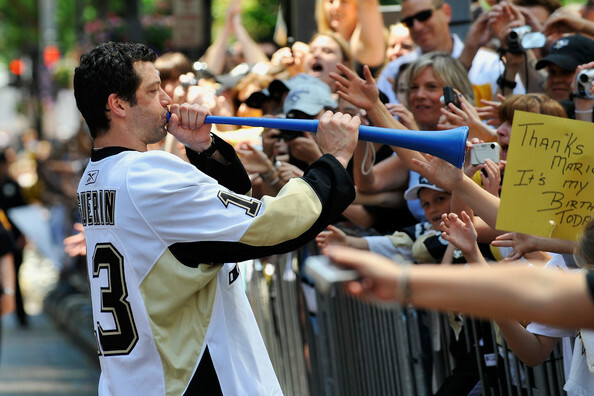 "This is a matter of whether he will be ready for training camp and then, if not, when can he go hard," Shero said. I'm not pushing any kind of panic button because I actually like the moves that this team has made, but this team is now missing three of the top six point scorers from last year (Ponikerovsky is technically third on the team in points, i'm too lazy to go back and count how many he actually had with the Pens). The only one I'd worry about is Gonchar, who admittedly, everyone knew would be gone at some point. Heck, Michel Ouellet and Mark Recchi were top 6 scorers on this team just 3 seasons ago. As long as the big 3 are in place, you can find a marginal winger to put in 20 goals. Poni isn't a loss... at all. And we all seem to remember the gonch of old, not the old gonch that played last season. Young guns will step up to take Billy G's spot. Nothing to worry about, except Staal's foot. That was a rough injury and i hope he can get back to 100% for this season. Losing Staal for any period of time, or him not playing at 100% would be a much bigger loss than any old or lousy players lost from last yrs roster.